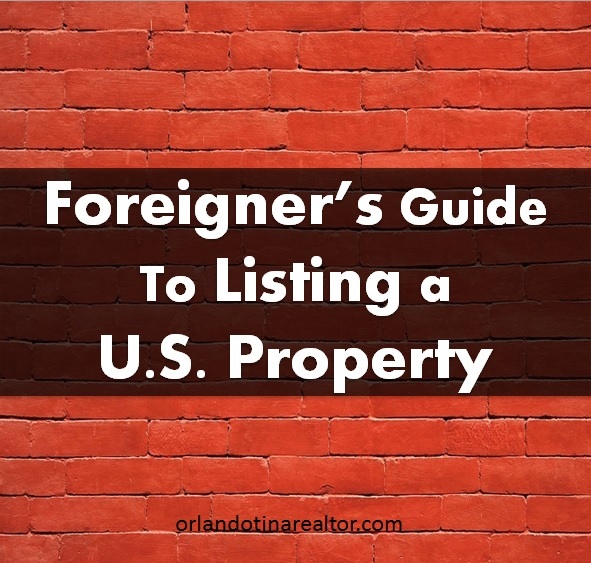 When a homeowner is preparing to list a home for sale and they reside outside of the United States, there are differences in the listing process they should be aware of. A testimonial from a previous United Kingdom client prompted this blog post, in an effort to help inform foreign sellers about some important things to know when selling a property in the U.S.
First off, not many foreigners are aware that when they sell their U.S property there may be a 15% withholding from the sale proceeds of the home. This withholding is called FIRPTA - Foreign Investment in Real Estate Property Tax Act. FIRPTA is a tax law that imposes U.S. income tax on foreign persons selling U.S. real estate. Under FIRPTA, if you sell your U.S. real estate as a foreign person, a withholding of 15% might be required from the amount realized from the sale. The amount realized is normally the purchase price. The above link to the IRS - Internal Revenue Service - will explain more about it. This is a very important step in the overall selling process. The right Realtor will make the difference in how long the property is on the market and for how much it sells for. My goal is to provide my clients with the same information, advice, and assistance I would want when making a big decision for myself. My job, as your Realtor, is to guide you through the complicated real estate process from beginning to the end. My goal is to net you the most amount of money in the shortest amount of time. In order to determine the best (and accurate) price tag for your home, your chosen Realtor will look at a variety of things including the current real estate market, the homes that have recently sold in your area that are comparable to yours (Comp’s), competitiveness of the market, and will also take into consideration your current situation. The listing price of your home is a major determining factor for how successful the process will be. Overpricing your home is one of the reasons your home will take longer to sell, costing you, the seller, time and money. I’d also like to note here that a title company is normally used in facilitating the closing, researching the property title, researching if there are any liens on the property and keeping the escrow. The listing agreement generally includes the length of the listing period, the listing price, the amount of the commission, and any exceptions to the commission. I’d like to note here that a key difference between selling a home in the U.S. versus outside of the U.S. is that the commission INCLUDES everything, even marketing of the property and paying the buyer's agent. The marketing of the property will reflect an established history of how buyers search for, and purchase, homes. • 95% of buyers use the Internet during their home search therefore your listing will then be placed on leading real estate websites, and more than 80 national sites and includes Proxio, which is an international site. In addition, your home will be featured on my website, Facebook Page, and Google Plus. • Your listing will then be placed on leading real estate websites, and more than 80 national sites and includes Proxio, which is an international site. In addition, your home will be featured on my website, Facebook Page, and Google Plus. • The most effective way to get the attention of productive agents and potential buyers is through accurate pricing and great photography. • In addition to professional pictures, I will create a high-definition video of your home. A well-scripted, and produced, video gives potential buyers a feel for what living in the house could be like-long before they make a personal visit. To learn more about what makes me a great partner in the sale of your property – please visit the “Testimonials” page. Give me a call! Let’s sit down and discuss getting your property SOLD so you can get on with those plans you have. I would appreciate the opportunity to earn your business!